​When there are storms, wind or rain, your gutters can become clogged and the water will overflow or back up in them. This can cause damage to the home's roof, walls, and foundation. It can cause the fascia board to rot. It can cause roof problems, the wall to rot and the foundation to soak up a lot of water. Keeping your gutter system well maintained and cleaned will help you to protect your valuable investment in your home. Our gutter company is a top rated leading gutter installation service. We are licensed and insured to serve your area and the surrounding towns. You may contact us to get a free quote on new gutter installation service. If you have been searching for someone to install your new gutters, then you have come to the right place for high quality service. We can offer our clients reasonable prices and discounts on gutter installation. All gutter services come with a complete guarantee too. 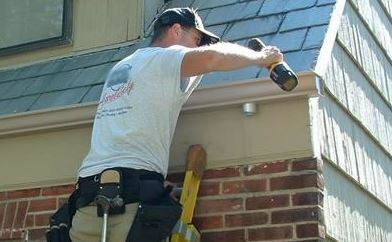 We have friendly and professional staff who can serve you by arriving at your home to install your gutters. If you plan DIY, then you must make sure you place safety first. Our company is equipped with the right tools and safety equipment to get the job done right, save you valuable time and quite a bit of money and hassle too. You should clean your home’s gutters every spring season and fall season to keep them working like they should be. Leaves, twigs, and dirt can build up and clog up the downspouts, which will cause the water to over flow and backup and this is what causes damage to your roof and fascia board that is found behind the gutters. Water pouring over the gutters sand backing up or from leaks can will be soaked up into your home’s foundation, flood the basement or the crawlspace, damage walls and roofing. Our company can help you prevent all of these gutter problems by providing you with new installation gutters on your home. A good gutter system will protect your home from becoming damaged by rain water. DIY installing gutters can be time consuming and unsafe if you are not skilled for the proper equipment. You may contact us to get a free quote or estimate, a free consultation to help us determine your gutter installation needs. We can accept online payments and payments by phone or in person and our company ensures that every client's payment is safe and secure and we never share personal info with others. You can save yourself from having to climb ladders and installing your own gutters by giving us a call today. Don't let your leaking and cracked gutters ruin your home. We can make prompt and efficient new gutter system installation. Contact us to do a gutter system installation for you. After we complete the inspection, we can tell you if your gutters need to cleaned, repaired, replaced, new gutter installation, need new downspouts, and more. We are your best choice in gutter installation for your your home investment.